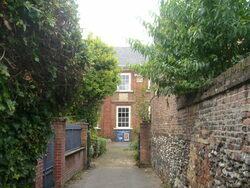 The Best Hidden Church in Norwich! Finding this chapel can be quite a challenge as it was built during a time when there was little religious freedom. Now that you have discovered it we hope that you might find some time to explore the chapel's history. Perhaps you might be inspired by the faith of the people who found it. Perhaps you might find a sense of history. Perhaps you might even find faith in the God who has been worshiped here for over 300 years! The Scriptures advise us to learn from examples of faithful ministers (Heb. 13:7). The Independents or Congregationalists of seventeenth-century Britain are a body of such ministers, whose teaching and living can be particularly encouraging to those of us who are living during troubled times. They were steadfast in adhering to Scripture as the Word of God, in confessing the great truths of the Reformed faith, and in applying sound doctrine to the problems of life in an age and culture with many parallels to our own. The Old Meeting House Congregational Church stands today, not only as a fine specimen of the architectural taste of the 17th century, but also as a worthy memorial to our fathers in the Faith. Let us who come within its walls spare time to offer this brief prayer. Almighty and everlasting God, we thank You for this House of God and Home of men. Grant it increasing usefulness in the service of Your Kingdom. We thank You too, for those who, in times of darkness, kept the lamp of faith burning; for great souls who saw visions of larger truth and dared to declare it; for all who fought for truth and liberty; for the quiet and gracious souls who were a blessing to many; for preachers raised up to declare the message of God with power; and for all faithful witnesses to the life that is in Christ. Almighty Father, who knowest our downstting and our uprising and art acquainted with all our ways, make us ever to be glad and rejoice before Thee. Give us the tractable spirit of hope and love and of a sound mind. Take away from us all ungodly fear and all inhuman hate, all fretful temper and all dark self-will. Clothes our lives with modest mirth and our age with beauty of holiness. May our life begin, continue, and end with Thee. On Monday 11th February at 7pm we will be having our next talk. Our special guest speaker is Dr Larry Harwood who is Professor at the School of Arts and Humanities at Viterbo University, Wisconsin, USA. The title of the talk - Flying Beneath Deadly Radar: A Lay Puritan Network in East Anglia and Targets Beyond, 1603 - 1642. Panoramic views of the Chapel now available! Norwich 360 has just released some panoramas of the Chapel; please see our page for more information.